Herbs! I have been cooking with so many herbs. I planted herbs in about half of our raised bed garden this summer and it is so nice to walk out to the back yard and come in with all the herbs I need for my meal. We throw them in everything. We toss them in salads, soups, veggie dishes, sauces, and even iced tea and lemonade. Below are a few of our favorite current dishes we came up with over the last few weeks. 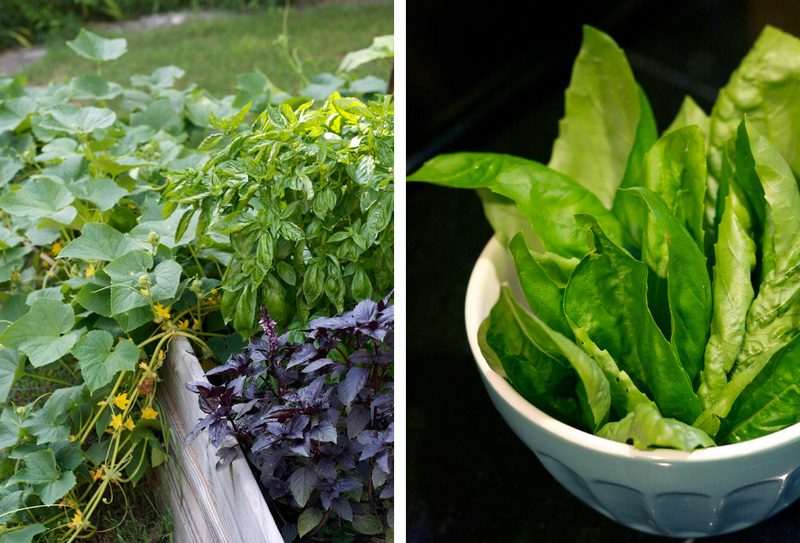 Herbs, while being super tasty, also provide many health benefits to the body. There’s power in those herbs! Plus, they smell amazing. 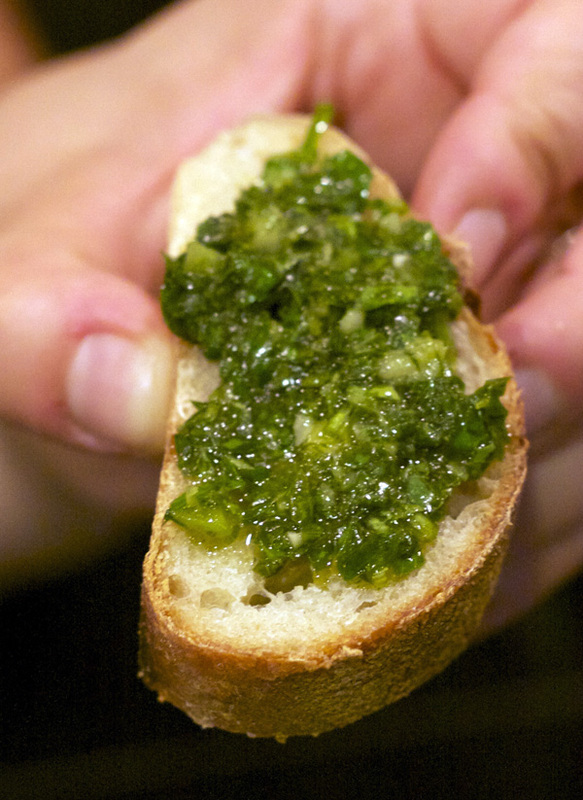 I made this Chimichurri type sauce as an accompaniment to a sliced Bella (their bread is delicious!) baguette one weekend recently when we had company visiting. We realized this would be excellent on top of grilled vegetables, meat, or fish. 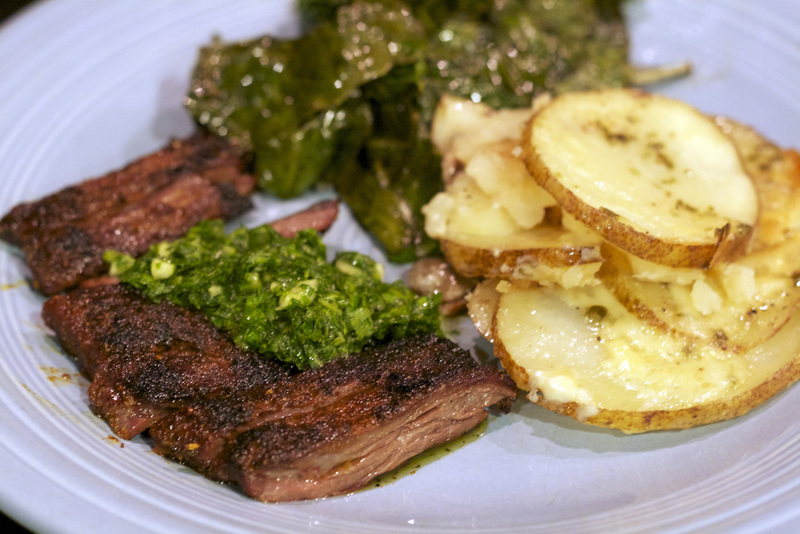 We later used it on top of a local skirt steak from our neighborhood Porter Road Butcher. 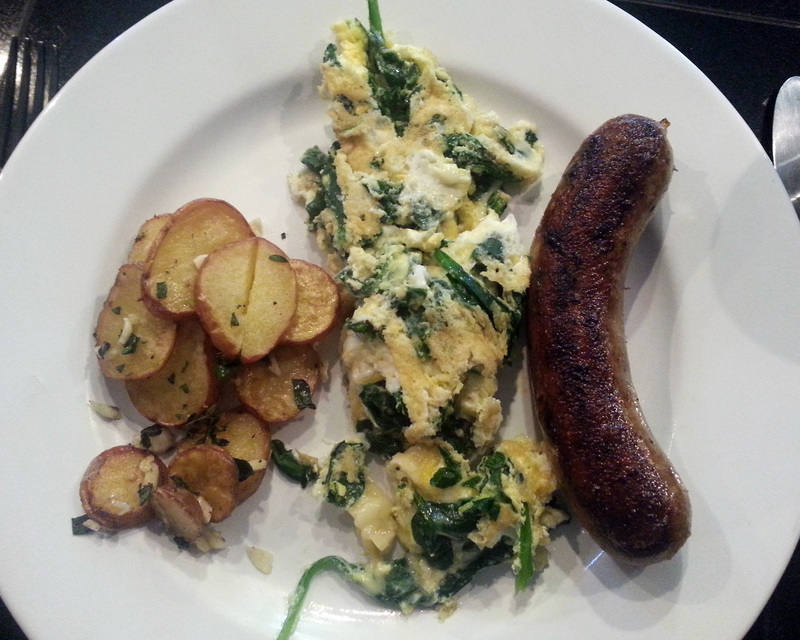 You can use any herbs you have really and I added a little piece of a jalapeno pepper to give it some kick! Grind all together in a food processor (I have a mini one and use it all the time. If you find yourself without one, you can just chop everything really well and mix thoroughly). Store unused in the refrigerator. This next recipe is based very loosely on a Trader Joe dip that a friend of mine used to always serve at parties. I really liked the flavors and eventually created this based on my memory of that. It is yummy with cherry tomatoes and pita chips. Preheat oven to 400. Toss potato slices with the olive oil and butter and space evenly, in one layer, on a baking sheet or oven proof dish. Place dish in oven and roast for 30-40 minutes, until potatoes are golden brown. Remove from the oven and toss in the herbs and garlic. Salt and pepper to taste. Place the dish back in the oven for 5 more minutes. Serve. I love summer squash and one of my very favorite things to make each summer is 101 Cookbooks’ recipe for Buttermilk Squash Soup. I know, soup in the summer doesn’t sound so appealing in the hot south, but this recipe is so yummy and comforting that it works. I wasn’t setting out to change her recipe by any means. It really is perfect the way it is, however, I found myself in for the day, ready to cook, and with no cumin seeds, which is one of the main ingredients. So, I adapted her original recipe to fit the herbs I had in the garden. I was skeptical but it turned out really well so I decided to post it. This would be great for lunch or served in little cups as an appetizer for the perfect Southern summer dinner. By the way, be sure to find some organic squash if you don’t have any from your own garden. It is one of those crops (along with zucchini, corn, soy, beets…) that has been contaminated and overtaken by GMO seeds so unless you have organic, there’s no telling what you might be eating. In a soup pot, melt the butter over medium-high heat. Add the onions and a teaspoon or so of salt. Saute for a few minutes, or until the onions start to get translucent. Stir in the potatoes and cook for 10 minutes. Add the squash and cook another 5-10 minutes. Stir in the stock and bring to a boil. Add in the chopped garlic and herbs. Reduce heat to a simmer and cook until the potatoes are tender, roughly another 20-25 minutes. 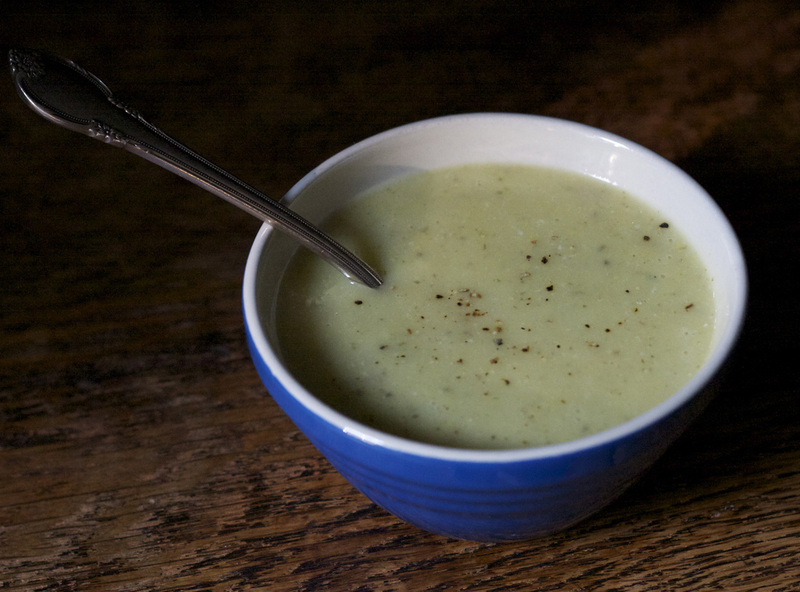 Remove the soup from heat, puree completely with blender, return to the stove top and then stir in the buttermilk. Taste and add more salt if needed. My friend and I have recently declared Mondays to be “Wild Cow Mondays” and tend to eat there for lunch most Mondays. It sure brightens up a usually hard work day and kick starts a week of healthy eating. In addition to having some of the yummiest vegetarian food in town, serving lots of local and organic veggies, Wild Cow makes the best tofu dishes. 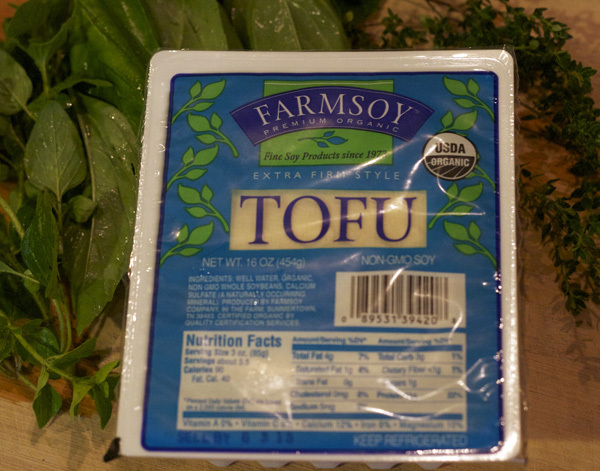 It has made me suddenly way more excited about cooking with tofu. Also, The Turnip Truck carries Farm Soy Tofu made in Tennessee out at The Farm so knowing I can buy locally made tofu from a source I can trust is nice. A block of this tofu in the refrigerator and all that basil in the garden inspired me to make this Italian-style tofu dish. It was again one of those dishes that came about because of the ingredients I had on hand. It was a bit of work but totally worth it. We really enjoyed it. Heat the oven to 400. In an ovenproof baking dish, place the tomatoes, onions, and garlic in and drizzle with olive oil and balsamic vinegar. Roast for about 40 minutes. Remove from oven and cool slightly. 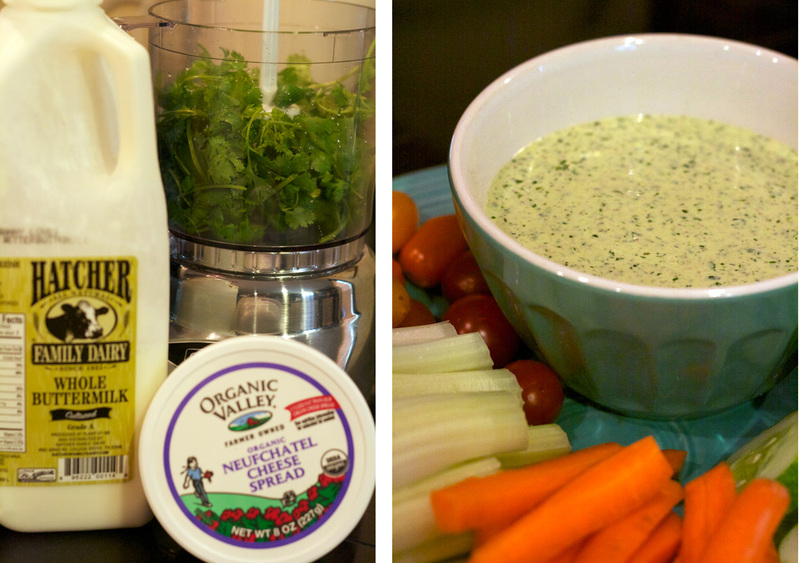 Place in a food processor or blender and blend. Place in a pan on the stove on low. Add the herbs and stir. 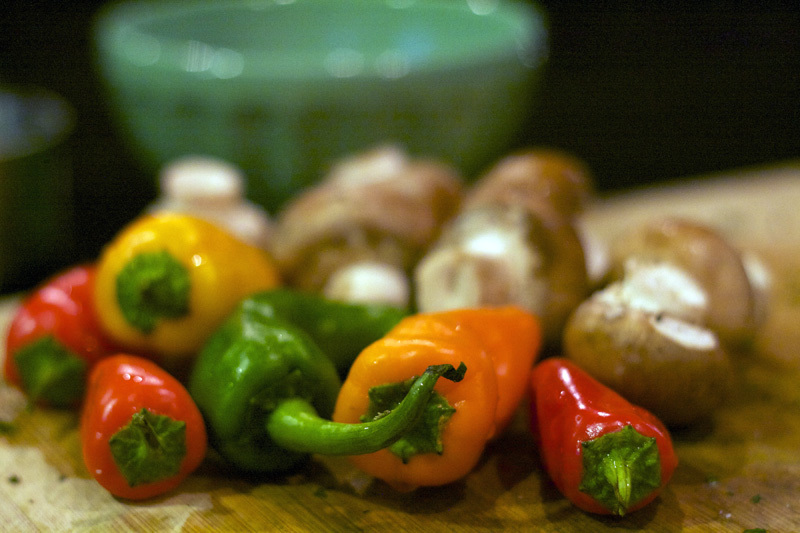 Cut the peppers, mushrooms, spinach and herbs and set aside. Cut the tofu into 8 slices, about ½” thick, and place on a towel to drain. Pat dry. 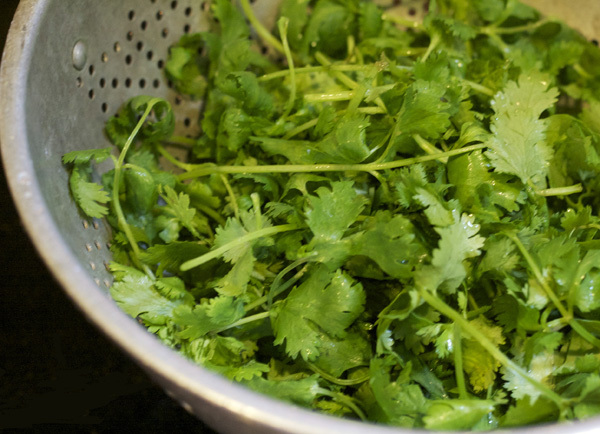 In a medium bowl, mix the herbs, cornmeal, herbs, and cheese. Add some salt and pepper (or you can season as you are cooking). In a small bowl mix 1 egg with buttermilk. Heat a skillet. Add a couple Tbsp olive oil. Dip each piece of tofu in the egg mixture and then coat with the cheese mixture. Place each in the skillet. I used an iron skillet and did 2 batches as to not crowd the tofu. After a few minutes, flip each piece of tofu over and cook for a few more minutes. Remove from the skillet and place on a paper towel to drain some of the oil off. Add a tad more olive oil and then saute the peppers and mushrooms. Add the spinach and herbs. Salt and pepper to taste. To serve, place the sauteed veggies on plates. Place 2 slices of tofu over the veggies and then spoon some sauce on top of the tofu. Top with grated cheese if desired. 1. Jason Isbell’s Southeastern is an excellent follow up from his last studio recording (and one of my favorites) Here We Rest. You can hear him here talk all about it and perform a few cuts from it on Fresh Air with Terry Gross that aired this week. The more I listen to this album, the more I love it, which is usually the case with Jason’s songs. He is an incredible writer. He’s one of those rare artists who is equally dynamic- whether singing in a large venue with his full band or in a tiny room with just his guitar. This guy’s going places. And if you live in Nashville, be sure to get tickets to his Ryman show in August. Caitlin Rose is opening. What an incredible show that will be! 2. Kelly Willis & Bruce Robison‘s Cheater’s Game is a really nice collection of their favorite love songs. Both of their voices are so beautiful on their own and together, they really can sing the duets. I love the uniqueness of this group of songs and it is nice to have some new favorite country duets to add to my ongoing playlist. 3. Son Volt’s Honky Tonk. If you’re like me and your favorite Son Volt song (and quite possibly the only one you can really think of) is, “May The Wind Take Your Troubles Away”, then you will love this album. They brought the twang back. 4. A nice compilation of John Denver songs titled, The Music Is You: A Tribute to John Denver put out by ATO Records. This album is a good reminder of how great a song writer John Denver was. This is a collection of some of his best songs with a diverse mix of some interesting folks singing them. I became aware of it because WSM had been playing Take Me Home sung by Emmylou Harris and Brandi Carlile. The first time I heard it, I actually didn’t like it and it totally caught me off guard but the second time, I loved it and needed to hear it again and again. Eventually I fell in love with the whole album. I’ll close with this video of Kelly Willis & Bruce Robison singing Border Radio written by Dave Alvin & The Blasters.